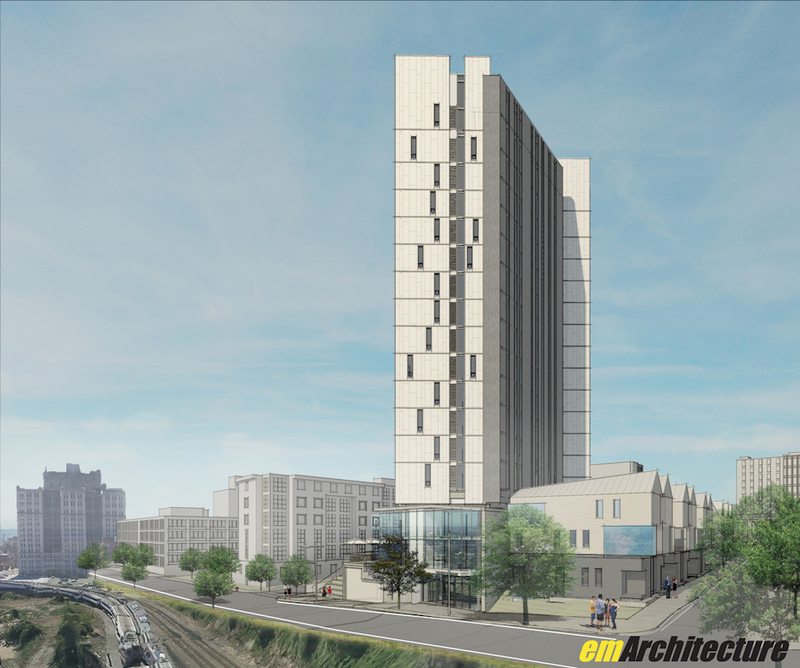 Developers plan 16-story complex near Drexel in Powelton Village. By James Jennings·	 4/6/2015, 11:32 a.m.
A Drexel-owned lot at 3201 Race Street looks to have a new life in its not-too-distant future. 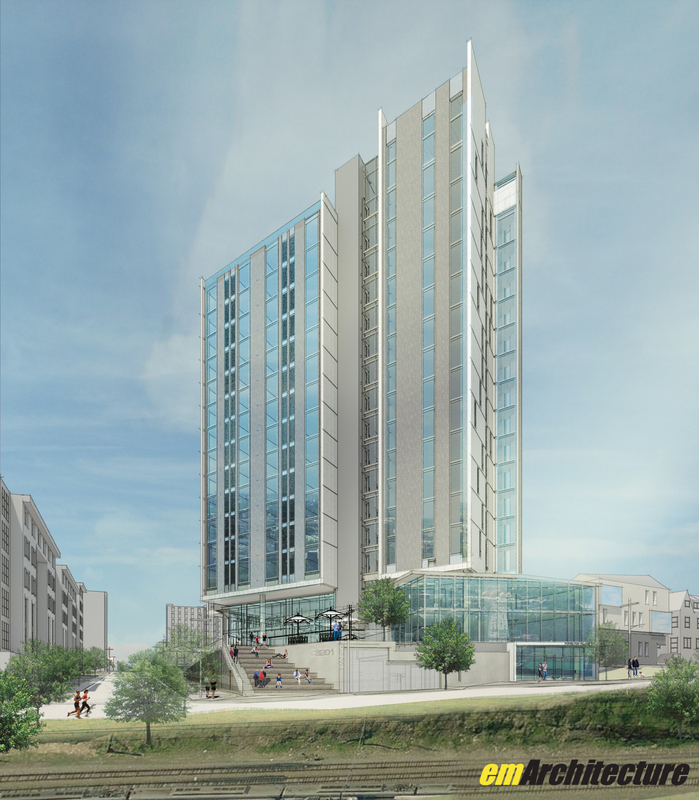 Radnor Property Group plans for a glassy 16-story apartment tower designed by Philly-based Erdy McHenry Architecture. 164 market rate apartment units will rise above a mixed-use platform that will contain a large childcare facility and a public green space that looks over the train tracks towards Center City. David Yeager, president of Radnor Property Group, said the project was born out of a request for proposal from Drexel University for projects geared towards market rate housing and childcare for their staff and the nearby community. Yeager described it as another “cog” in the wheel of Drexel president John Fry’s vision for the Innovation Neighborhood and beyond. The project will also include 12 market rate townhomes to the north, a green roof and an underground parking facility with 26 spaces. There are also 61 bike spots and two car share spaces. It’s also important to note that this won’t be undergraduate housing. Yeager said they’ll be marketing the units and homes to young professionals, faculty, staff and graduate student. 75% will be one-bedroom units, with the other 25% being two-bedroom layouts, providing “prime” views of Center City. Radnor Property Group is rounding out their 26-story mixed-use tower at 3737 Chestnut Street. “We view [3201 Race Street] as the same–the next stepping stone, the next project for us,” said Yeager. It still early in the process, but Yeager said they hope to get started on the project late-2015/early-2016. Construction is expected to take 18 months, with the goal of opening in the spring of 2017. According to the public Civic Deign Review documents, the childcare facility will be able to accommodate 150 to 164 kids and scholarships will be available to eligible families. Yeager said there will also be an outdoor green area for the kids to play. He called it a “driver” for Drexel to recruit good staff and keep it. Two important elements to the design of the project are the underground parking garage and the angle of the main mass of the building. Scott Erdy, principal of Erdy Mchenry, said the site is actually on a little bit of a hill, which allowed them to put the parking underground. That frees up the top of it for the community space. Erdy called it a “pretty spectacular space” in that it’s an extension of Summer Winter Community Garden, a community park next to the project at 33rd and Race, and also “frames” an amazing view across the tracks. The stairway is situated at the base of the park and will act as theater-like seating for the view. In engaging with the Powelton Village Civic Association, the project partners found that Summer Winter Community Garden was a community hub and the design helps keep shadows off of the park. “It was very important to respect the park,” said Yeager. Erdy said they were conscious of the scale of the neighborhood to the north and designed the townhomes to be of a similar height and size. The design has also maximized the green space of the site. A green roof, with an amenity terrace, is planned, the townhomes will have stormwater management systems and it will adhere to sustainability principles. Yeager said they’re “heavily” investigated LEED certification.